This article is brought to your by our friends at Renogy, whose RV solar panel kits will help you capture one of the average 294 sunny days per year in Las Vegas RV parks. Each year (especially during the winter) Las Vegas RV parks beckon outdoor enthusiasts, snowbirds, and gamblers alike. With a low cost of living and plenty to see and do, it’s easy to see why Las Vegas continues to grow year over year. Camping near Las Vegas means you’ll have quick and easy access to the outdoors, like Red Rock Canyon or Lake Mead National Recreation Area, as well as five-star dining, world-class shows, and endless slot machines. With over 300 days of sunshine and daytime highs in the low-60s, the weather remains prime for early-afternoon tennis matches, taking out the ORV to the surrounding BLM land, or enjoying buffet meals for bargain prices. 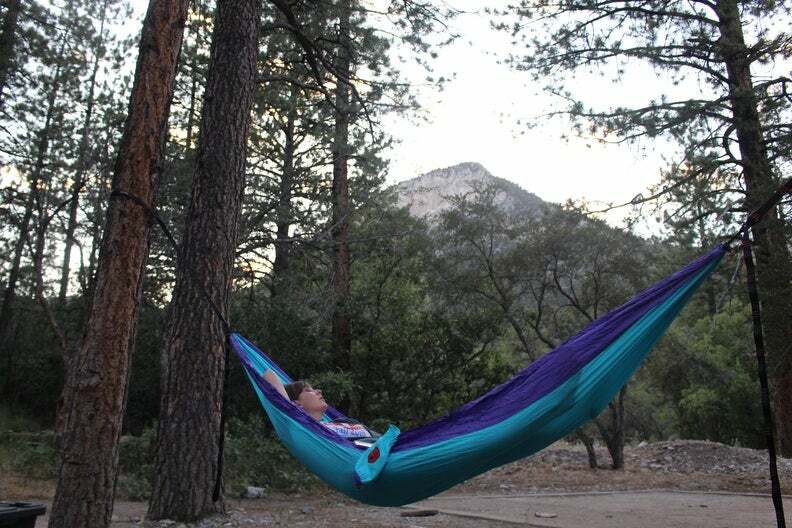 For those staying at a campground with a stay limit, Las Vegas sits close to many other southwest wonders like the Grand Canyon and Joshua Tree National Park for quick (or longer) getaways. Las Vegas RV parks offer daily, weekly, and monthly rates for RVers looking to stay a while. Each one is loaded with amenities like laundry, pools, book exchanges, even saunas. It can be tough to choose which one is right for you. But seasoned RV travelers on The Dyrt have shared insider tips on their favorite places to park their home-on-wheels. 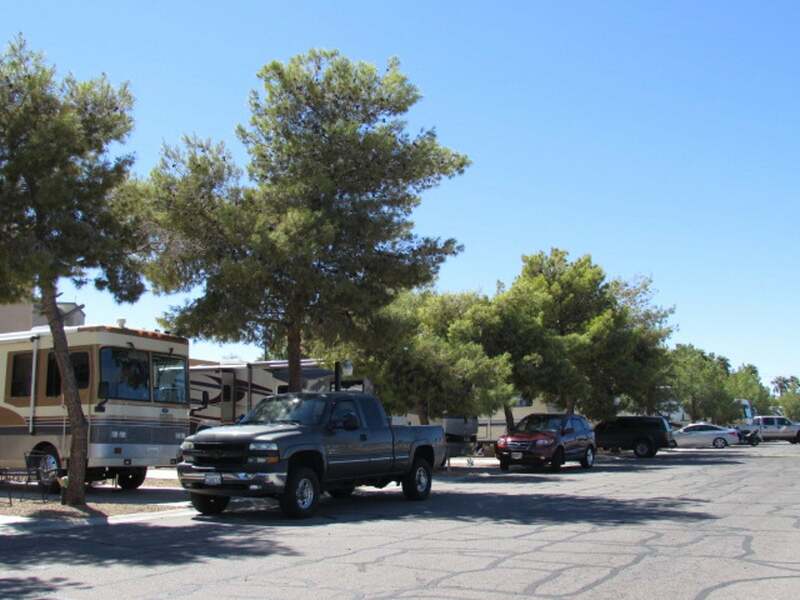 Here are some of their top picks for RV parks in Las Vegas. 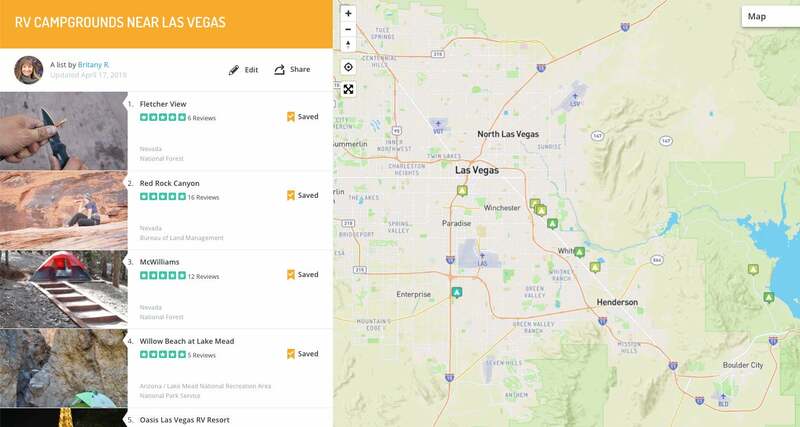 All these campsites are within 45 minutes of Las Vegas. And they are ready to soothe your soul with outdoor activities, solitude, and a night sky full of stars. Image from The Dyrt camper Rick B. To start, you can’t get much closer to the Las Vegas strip experience than by camping at the Circus Circus RV Park. Easy to find, this RV Park in Las Vegas is outside the Circus Circus resort just after The Mirage on Las Vegas Blvd. 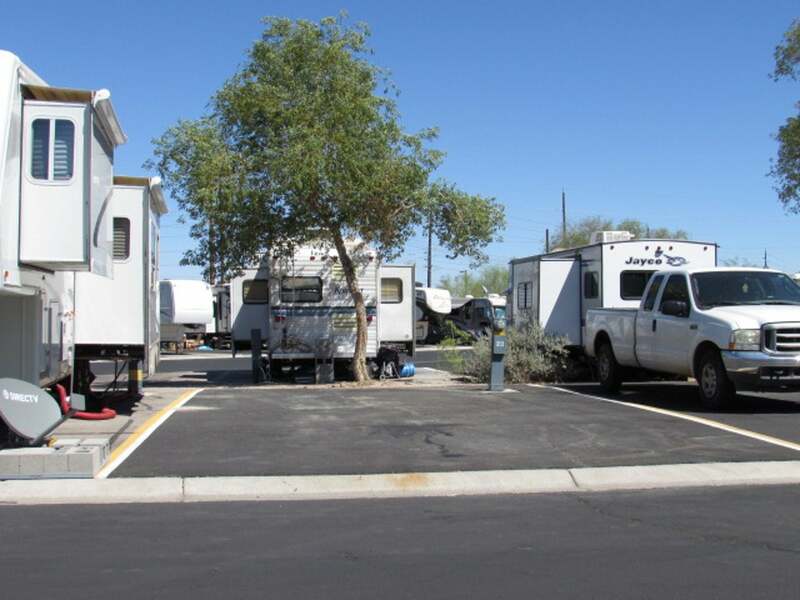 There are 170 big-rig sites at the Circus Circus RV Park, nearly half of which have added amenities like grass, patios, and patio furniture. Additionally, free wi-fi is available throughout this Las Vegas RV resort. What’s more, if you’re bringing your dog, he’ll stay clean at the free dog wash. Plus you can tucker them out at the off-leash dog park. The kids and grandkids will enjoy The Adventuredome at Circus Circus, the world’s largest indoor theme park. They’ll also love the free nightly circus acts at the arcade. That being said, you probably won’t want to spend an extended amount of time at the campground itself, but it’s a great start and end point to any vacation on the strip. “This is an older facility and sites are about $45 a night but the staff is friendly and in comparison to a hotel that is still not terrible to access parking for a rig and have in city accommodations. It does include hook ups.” — The Dyrt camper Crystal C.
Image from The Dyrt camper Rhonda S.
Staying at the Oasis Las Vegas RV Resort feels a lot like being pampered. There’s a cafe onsite for your morning cup of jo’. Even better, there’s a concierge service to help guests book show tickets, tours, and restaurant reservations. Sites vary from “Standard” to “Big Rig.” Standard sites offer desert landscape, with no picnic tables, and are furthest away from the clubhouse. However, Big Rig sites also offer decorative fencing, BBQ pits, and grassy areas. Rates vary at the Oasis from $47/night to $84/night. If you’re looking to stay for longer than a few weeks, they also offer monthly rates from $590-$999. Enjoy horseshoe pits, a family pool with built in waterfalls, and an 18-hole golf course. Another perk is the fitness center and spa amenities located within. Once you’re tired from walking along the strip all day, Oasis is your place to rest and relax. “Park landscape, restrooms and facilities are immaculate. Security is on 24/7 at the front entrance and all about thru the park. It is a “5” Star Park without a question. Too much to say about here other than give it a try. 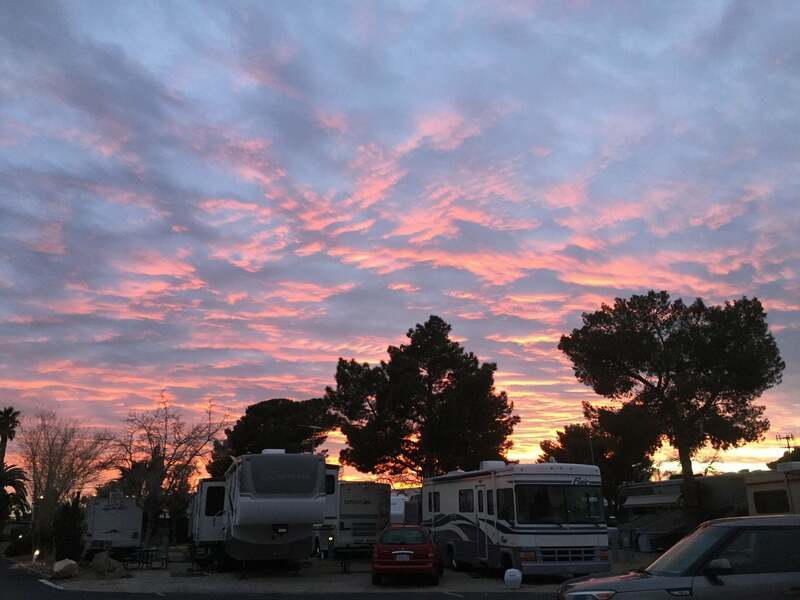 It is a resort and well worth the peace of mind.” — The Dyrt camper Pete L.
Image from The Dyrt camper Collette K.
Located just 7 miles from the Las Vegas strip, recently renovated Arizona Charlie’s offers the most serene Las Vegas RV parks experience. Over 200 sites from 30′-70′ are spread across the desert landscaped park. Guests can enjoy big screen TVs, pool, and a fitness center at the clubhouse. In fact, Arizona Charlie’s Hotel and Casino are only minutes away. At their casino you can find restaurants, gambling, and both a swimming pool and hot tub. A back-in monthly site reserves for just $680/month + taxes. Thankfully, 24-hour gate security and easy access to public transportation makes Arizona Charlie’s feel secure and connected. As a result, this is one of the best Las Vegas RV parks to visit. 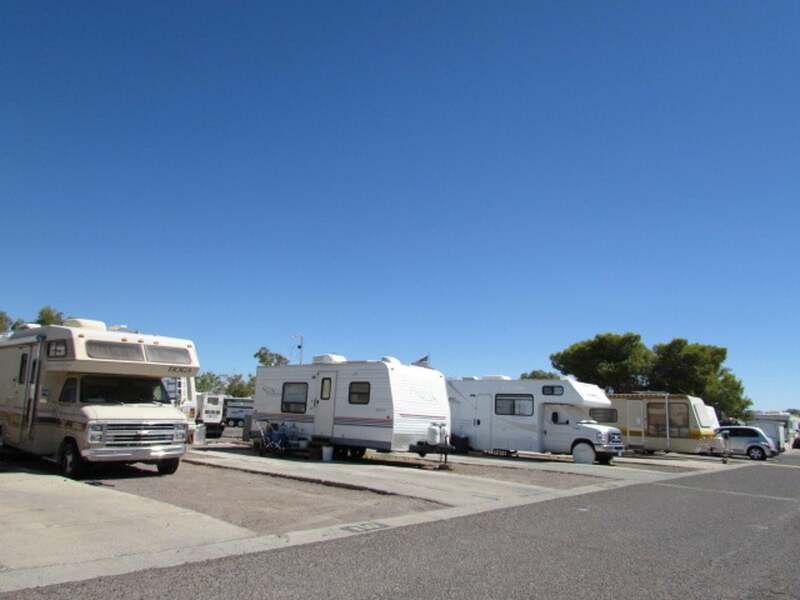 “Full hook-up RV park, with no shade structures and no picnic tables. Guests may use hotel amenities including pool. 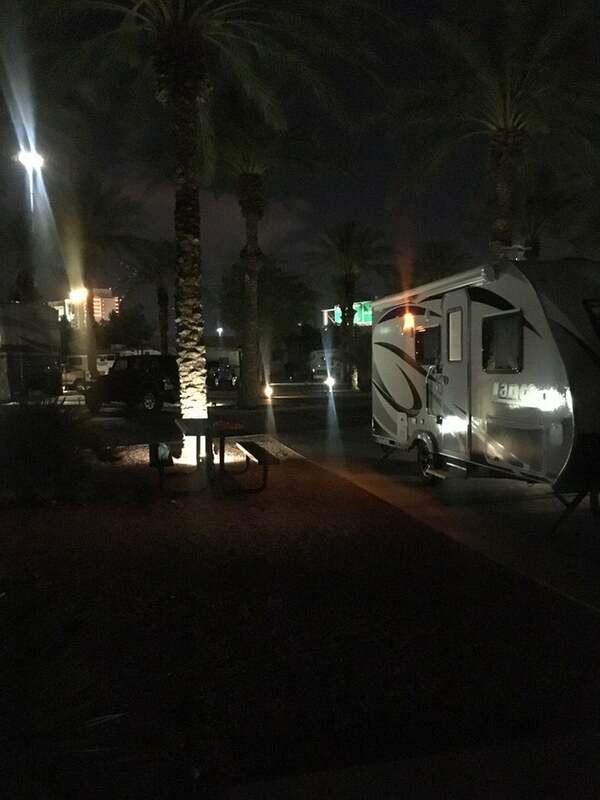 Arizona Charlie’s is a popular local hotel & casino, with easy access to downtown Las Vegas and nearby major thoroughfares.”–The Dyrt camper Collette K.
Image from The Dyrt user Collette K.
You won’t even have to leave the resort to enjoy a week’s worth of entertainment at Sam’s Town. Stay at a familiar location with Kampgrounds of America while enjoying games at the 133,000 square foot casino. Moreover, challenge your partner to a round of bowling at one of 56 lanes, or catch a movie at the 18-screen theatre. Catch a show, order a steak, or feast at the buffet. There’s tons to do! Once you’ve done all you can do at this RV haven in Vegas, catch a free shuttle ride down the strip for more fun. For example, go eat your heart out, catch a Cirque du Soleil show, or watch the fountains at the Bellagio. Then come home to well-manicured sites, some with patio furniture, a communal BBQ area, several off-leash dog runs, and mature trees for a respite from the Vegas heat. Sites start at $27.99/night. “Stayed here overnight when we needed to get the brakes done on the rig. A clean, decent place with clean, decent amenities. Nothing for the nature enthusiast as the camp is on Boulder Highway (a heavily trafficked and noisy highway). A lot of full time residents in this park and some real friendly folks.” – The Dyrt camper Deacon J. Dubbed one of the best places to retire by Money Magazine, Henderson, NV remains in the municipal district of Las Vegas and sits only 16 miles from the strip. It’s far enough out to make you feel removed from it all. However, it’s close enough to easily see a show, or enjoy one of Vegas’ world-class buffets. With adobe inspired buildings, Desert Sands is a frugal and fun option for any length of stay in the Silver State. The onsite clubroom offers wifi and a flat screen TV with DirectTV, and the showers include access to a sauna. In addition, quick convenience items are easy to find at the old-fashioned general store, which also includes a cafe and mail service. You’ll feel like you’ve stepped back in time at the Desert Sands Resort. Nightly rates start at $25, with monthly rates starting at a welcoming $385. 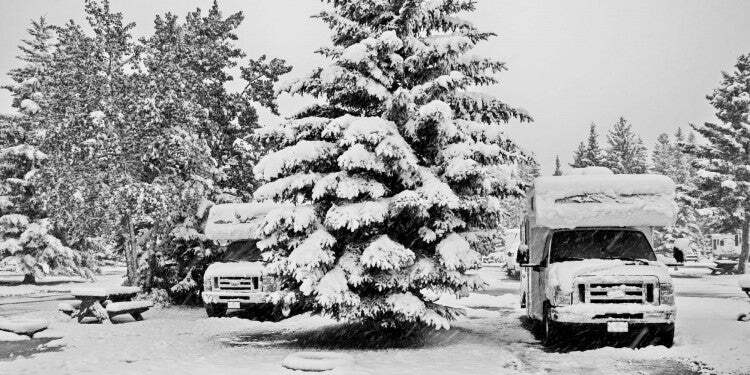 “Many older RV’s with long-term stays. However, it is an interesting old place… with Pittman General Store & Café, pool with outside walls, full hook-ups, laundry, mail service, security, and adults only. Easy access to downtown Las Vegas, with nearby shopping malls and casinos.” – The Dyrt camper Collette K.
Stay within walking distance of pharmacies, grocery stores, and banks at the Road Runner RV Park, without spending your entire retirement on site fees. Prices aren’t bad here: Stay for a night, $24, a week $104, or a month $359. 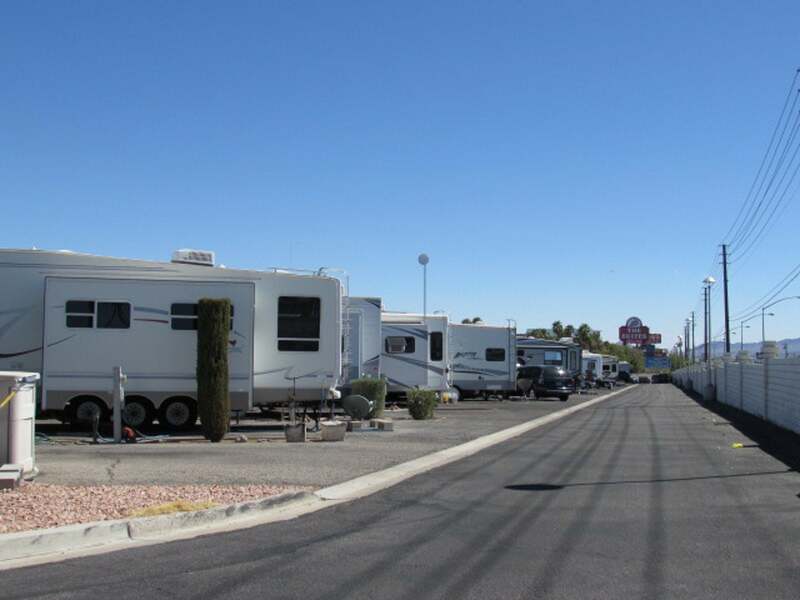 As a result Road Runner is one of the most frugal Las Vegas RV parks. Enjoy free coffee, on-site mail services, and private showers. Or, maybe you want to get out for a quieter Vegas experience next to the Boulder Highway. Spend some alone time in the reading room, or soak up the sun next to the pool and jacuzzi. And when you’re getting antsy, hop in the car and make the 15-minute drive down to the strip. Public transportation is also easily accessible and only a .2 mile walk from the resort entrance. Busses run every 15 minutes, and it takes about 45 minutes to reach the strip. “Daily, weekly, monthly rates. Allows older RVs. No shade structures or picnic tables. Pool & spa, laundry, restrooms, and mail service. Easy access to downtown Las Vegas and nearby major shopping centers, casinos, and restaurants.”–The Dyrt camper Collette K.
What makes Duck Creek unique is it’s immediate access to Silver Bowl Park, a 96-acre grassy park perfect for kicking around a soccer ball, or rolling out the picnic blanket. It’s also close to the Las Vegas strip, McCarran International Airport, and multiple grocery stores, banks, and pharmacies. Let the dog burn off some energy at one of two off-leash areas on site, or throw the tennis ball at Silver Bowl. If you’re out of change, there’s a machine onsite for laundry days, and a free book and DVD rental center to kill time while you switch between light and dark loads. Site prices are reasonably low, with standard sites nightly $36.16, weekly $192.10, and monthly $485.90, and premium sites $62.15 nightly, $271.20 weekly, and $666.70 monthly. “Very clean & popular with asphalt roadways, newer RVs, long-term & short-term stays, store, restrooms with showers, pool & spa, and dog park. 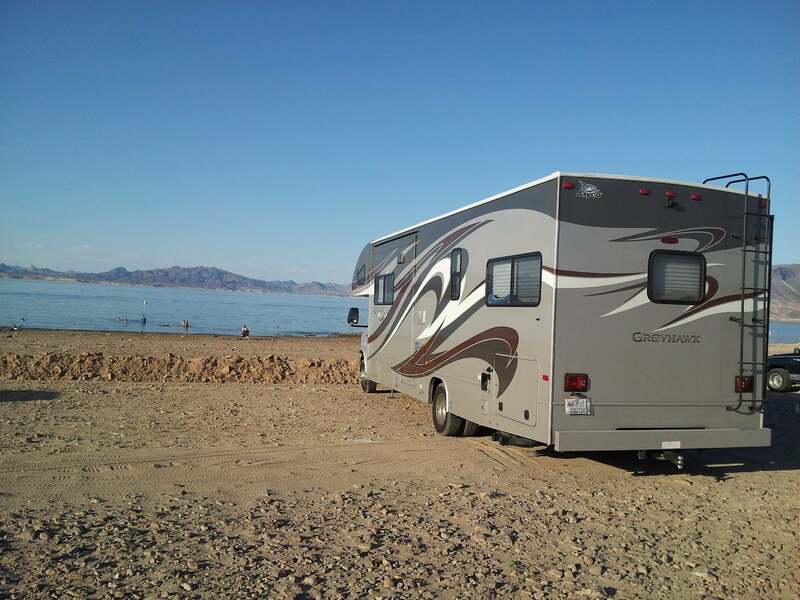 Easy access to downtown Las Vegas and nearby major shopping and casinos.” – The Dyrt camper Collette K.
Image from The Dyrt user Christy C.
If you’re looking for a more removed and remote experience, Lake Mead RV Village offers solitude and respite from the hustle and busyness of most Las Vegas RV parks. 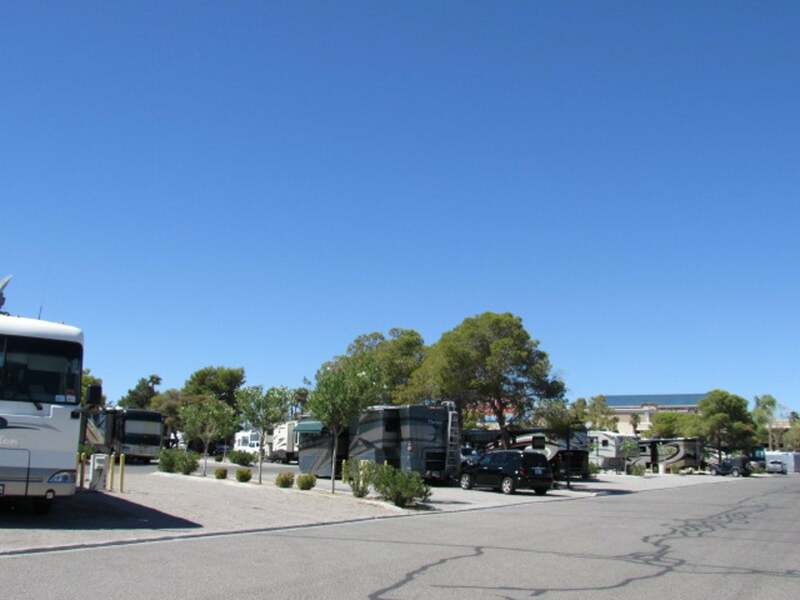 Located near the Hoover Dam, this RV park allows guests to enjoy the beauty of nature and the luxuries of the city. Free wi-fi covers the entire RV village and both gasoline and propane are available onsite for purchase. There’s also a general store for when you run out of toothpaste and don’t want to make a trip into town. The Las Vegas strip is a short 40 minute drive from the RV village so you can catch shows, or try your luck at the casinos. If you own a boat, the RV Village offers a ramp to launch, and if you choose to fish, make sure you have a valid license available from one of the marina’s on Lake Mead. Their rates will make it easy to stay and have a luxurious winter: $30/night, $165/week, and $495/month. 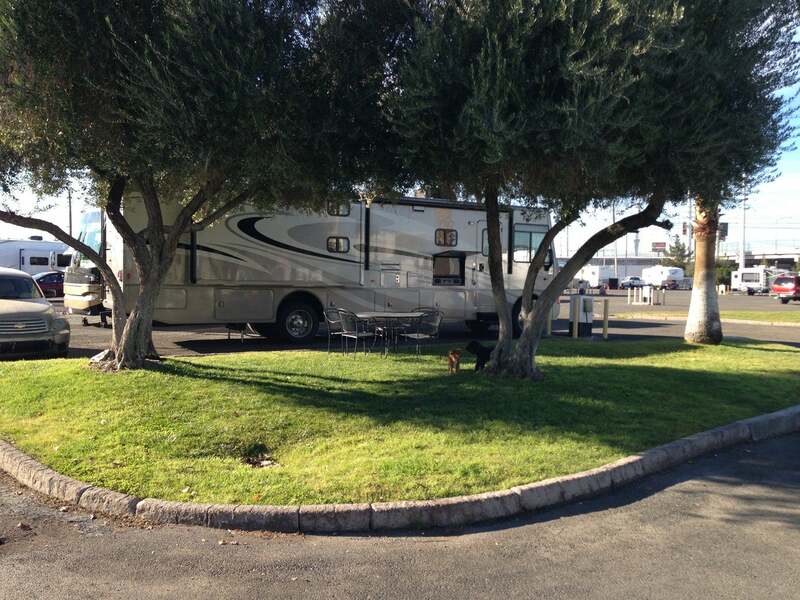 “This RV park had full hookups which is always a plus when you are traveling. We utilized the laundry facility here and caught up on some computer work since they had wi-fi. It was very hot so we took the RV to the shores of Lake Mead and parked for a rock skipping contest and to cool off. The water was very warm which wasn’t at all what I expected.” – The Dyrt camper Christy C.
Image from The Dyrt user Joshua R.
Thousand Trails has all the amenities you’re after, plus easy access to the strip. Take your dog to the dog park by the welcome center, soothe your muscles in the jacuzzi, or shower at one of three facilities onsite. Challenge your camp neighbors to a game of horseshoes, then gather around the BBQ for burgers or brats. Walk less than a mile to the Parkdale Recreation and Senior Center or the Boulder Station Hotel and Casino. Sites were recently renovated at Thousand Trails to improve gravel around the sites and three newly renovated cabins, perfect for when friends or family come to visit. Thousand Trails also puts on activities throughout the week like karaoke, movie nights, and game nights, as well as a Sunday worship service. Members camp free, and non-members can reserve a site starting at $44/night. “With a little over an hour’s drive north you can visit Valley of Fire State Park for an amazing day of hiking and exploring. You can even catch a glimpse of petroglyphs scribbled on the vibrant red faces of massive boulders and cliffs.” – The Dyrt camper Joshua R.
Put simply: Hitchin Post RV Park is packed with amenities. From a full-service dog wash to a recently constructed putting green, to free cable TV and a heated year-round pool, if there’s something you wished an RV park would have, Hitchin’ Post probably does. If you want to stay fit, you can head to the fitness facility on site and if you’re worried about safety, the entire park is gated with 24/7 security. When it’s time to venture out, Fremont street is a short 6 miles away, so you won’t break the bank if you want to hail an Uber or Lyft. But chances are you’ll feel so at home here that you’ll rarely need to leave unless you need necessities. “With this park they keep that [RV length] in mind and have all pull thru sites to make the journey into camp easier and your unwinding begin a bit more quickly.”–The Dyrt camper Crystal C.
Since Fletcher View sits on a flood plain, it’s generally closed to the public during monsoon season (mid-July to mid-September), but consistently remains open during the rest of the year. The 11 sites are set back into the woods with direct vistas of the surrounding mountains in the Spring Mountains Recreation Area while also offering immediate access to more than 60 miles of horseback riding and hiking trails. Equipped with picnic tables, fire rings, and consistent wildlife sightings, each site here gives campers a feel that they’re far and away from everything–when they’re only 23 miles from Las Vegas. The sites here do have electric hook-ups, but at 7,000’ you probably won’t need your air conditioner, which means more time toasting marshmallows and reminiscing around the campfire. 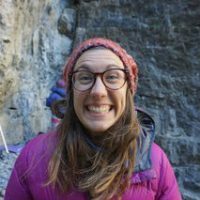 “The bathrooms at the facility were just as impressive at the individual campsites which quickly let me know why it was such a popular place to stay. There is a lot of attention to detail for family campers at this campground in comparison to other campgrounds in the area, well worth the $33 a night.”–The Dyrt camper Crystal C.
The McWilliams campground is camping near Las Vegas that’s part Dolomites-like hills and part desert-y charm. 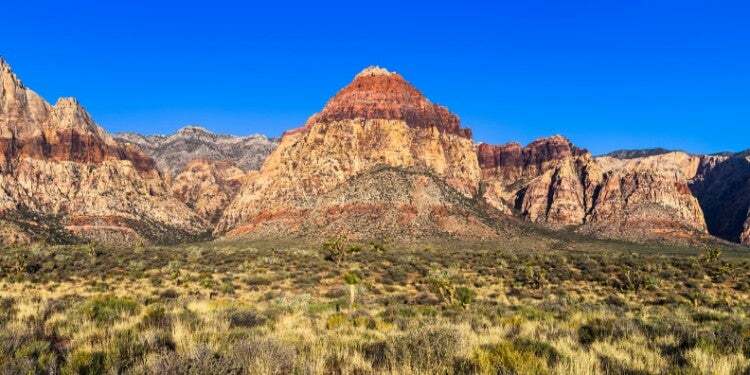 It rests in the beautiful, rocky landscape of Mount Charleston, just east of Las Vegas. It’s the perfect place to escape the summer heat, as it’s usually ten degrees cooler. With hiking, biking, and climbing nearby, there’s no shortage of activities to keep you busy. “When we want a camping retreat and a break from the Vegas heat, McWilliams Campground is definitely the choice. 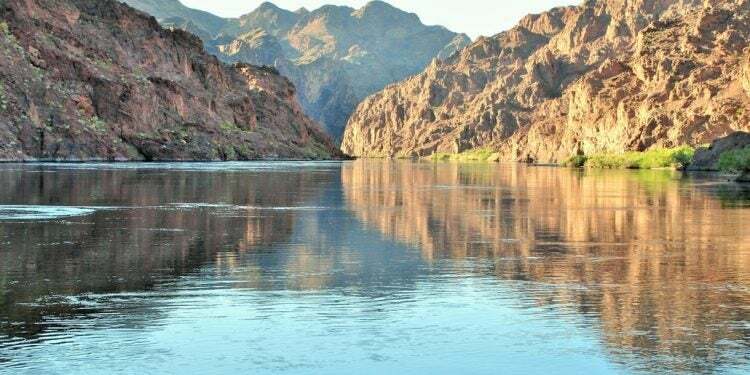 I can honestly say, for being a desert, we’ve got a pretty great camping spot here.” —The Dyrt camper Nikki E.
If you want to spend time on Lake Mead and save money to later spend on the slots, Boulder Beach RV is the place to stay. 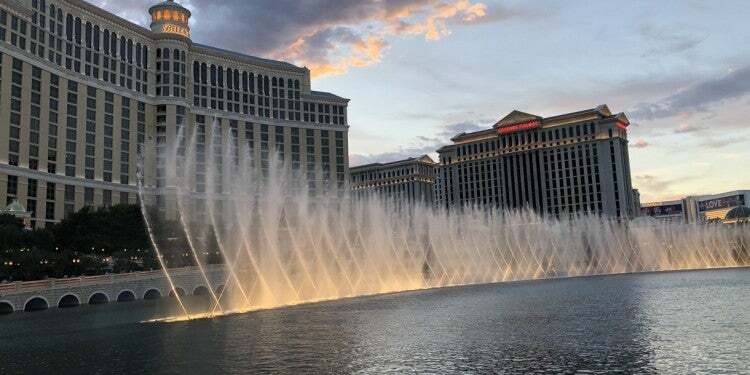 At $10 per night, you can’t beat the lakeside views and quick access to the Vegas strip. Along the shoreline, Boulder Beach offers swimming and just 1.5 miles down the street at the Lake Mead Marina, you can rent motorized boats starting at $50 an hour. Since Boulder Beach doesn’t offer electric hook-ups, it’s a better option for RVs in the winter when temps are cool enough to leave the A/C off (if you want electric hook-ups, head to Lake Mead RV Village, #9 on this list). Most sites are equipped with fire-rings and BBQs and there’s plenty of shade from Eucalptus trees to open up your camp chair and read the latest bestseller. “All sites are first come first serve, with tall trees, clean restrooms, water on tap, and friendly hosts. The “newer” side has been renovated in areas, along with the RV dump station area. 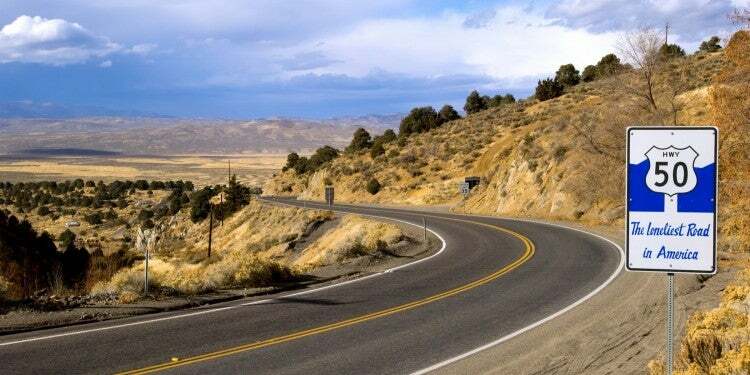 Cell service and shopping nearby in Boulder City; great bike trail, River Mountains Loop Trail; short walk to the lakeshore.” – The Dyrt Camper Colette K.
Ready to hit the jackpot? Save this list for camping near Las Vegas.